Have you ever been invited to a summer potluck and all you have to take is a watermelon you picked up a few days ago but were too lazy to deal with? So you decide to cut it up and take it, wondering just how lame you look? Did anyone notice you didn’t cook? Did they? Fear no more the dreaded fallback called watermelon! Just in time for the Fourth of July! Go bravely to summer potlucks. You are a good cook. P.S. 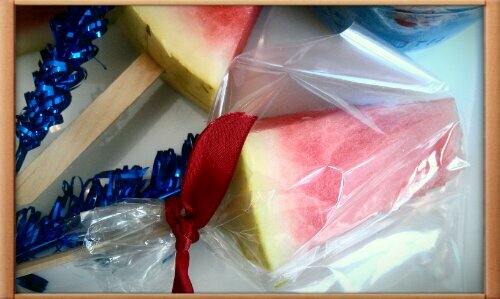 What if it rains on potluck day, the picnic is canceled, and you have tons of watermelon pops? I was just told these can be stashed in the freezer. When the kids want a treat, pull them out and eat immediately while frozen. How cool is that? Cool. This entry was posted in Snacks/Preschool Snacks and tagged Grain-free snacks, healthy kids snacks, Preschool snacks on June 25, 2013 by thehomeschoolingdoctor.